HG Logistics News Celebrating Independence Day! With July 4th just around the corner, it seems fit that our minds think first of the men and women in the Armed Forces who have given, or are giving, tremendous sacrifices to ensure our independence and freedoms as Americans. For many, this weekend will be filled with celebration. Some plan on taking youngsters to parades through small towns and large cities, collecting candy and memories with each passing float. Others can’t wait for the fireworks celebrations taking place all over the country, in back yards and city centers, lighting up the night sky is an all-time favorite Fourth of July pastime. For most of us, celebrating means that at some point, we will come together with family, friends and neighbors for a good old fashioned cookout. I was thinking about just that today and wondered if there are any new and delicious recipes that would be worth trying out this weekend. The catch is that they would have to be super easy and fast, because time will at a premium! I did a little searching and this is what I found…. 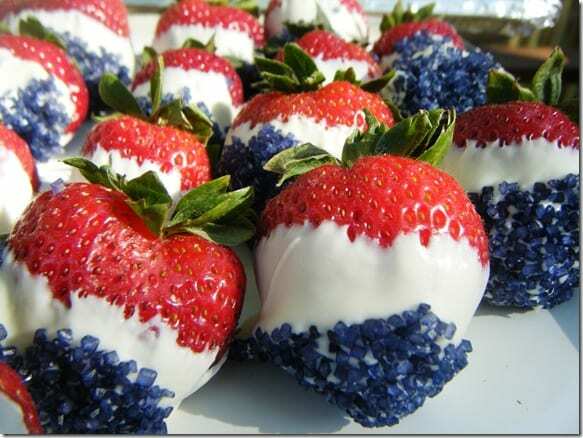 Quick, easy and delicious, these super-patriotic strawberries are sure to be a hit with kids and adults. Simply dip your rinsed and drained strawberries in white chocolate candy coating, and before it dries, dip in blue colored sugar. Beautiful! 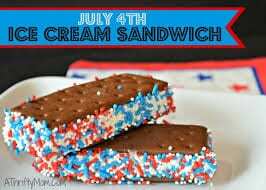 Another quick and cute treat is the patriotic ice-cream sandwich…simply unwrap pre-made ice cream sandwiches, allow them to soften just enough to roll in red, white and blue sprinkles and re-freeze. 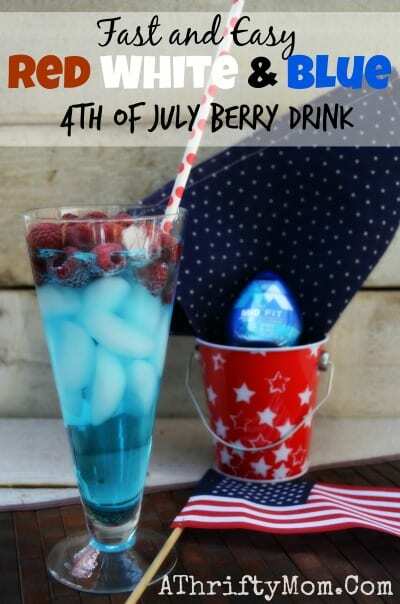 What could be easier than pouring literally and blue drink over white ice and adding red raspberries to the top? Another cute, fast and easy treat! Just be careful- if your party is serving adult beverages and children are around, that everything is kept separate! A wonderfully simple desert that my family loves is trifle. 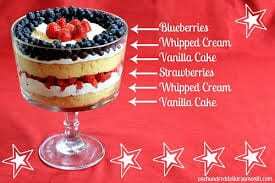 It is very simple to layer prepackaged white cake, such as angel food cake, cut into cubes, with strawberries, blue berries and whipped cream. You can even add vanilla pudding if you like it that way. YUM! What do July 4th celebrations have to do with HG Logistics? Well, for starters, there is patriotism and tradition. HG Logistics, a third party freight broker in Cincinnati, Ohio, loves our country and its traditions. We believe in the United States and enjoy the freedoms we have. We strive to show our business partners that we do not take things for granted, including those very business partners. We understand the sacrifices that go into protecting our freedom and are proud to put a veteran under our freight whenever possible. We also celebrate tradition. Traditions here at HG Logistics might not be just like the Independence Day parties we will go to this weekend, but they are foundational to our business just as your get- togethers are foundational to your family and friends. HG prides itself on the traditions of teamwork, respect and diligence. If these recipes sound sweet, and HG Logistics’ approach sounds even sweeter, give us a call and let one of our committed team members help you with your shipping needs. Talk to any of our dispatchers, sales people, or even call and ask for Doug, our General Manager- to find out what HG and our traditions can offer you! Give us a call at 513-244-3026!